The system only works with the more modern types of chip known as FDX-B (which store a 15 digit code), but these are the standard “microchips” in use today. If you have the option, tell your vet to place the chip in the back of the neck near the top, so when the cat stretches out to go through the cat flap it’s near the sensor (they often put them there anyway as it’s easy for them to read the chip using a handheld scanner). Having your cat microchiped is around £30. Getting it working is easy. On installing the catflap (which fits a standard fitting used by a traditional “Staywell” flap), just put in the batteries and press the ‘learn’ button. This will make the LED indicator flash and any cat then passing by the sensor will automatically be recognised, halting the LED flashing. To programme it for another cat, just push the button again and repeat the process. The unit will store up to 32 RFID numbers so if you happen to want to have 32 cats in your home, then that’s entirely possible (it also means if you forget how to reset the unit and you replace your cat for whatever reason, you can just add another). 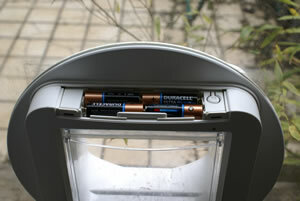 The catflap takes four AA batteries, mounted on the house side, which should last for about 6 months of normal cat activity. 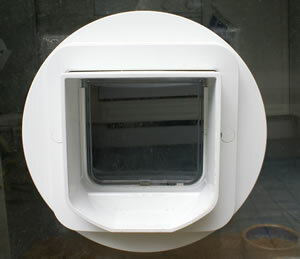 As mentioned earlier, the SureFlap fits into an existing hole for a Staywell catflap. There’s two halves which push together from either side and it’s made secure with two (supplied) screws. If the SureFlap is being mounted on a glass door there’s also a separate disc which just gives spreads the pressure and makes a better seal with the glass, the SureFlap still mounts the same way with either half being push from either side of the glass. The whole process only takes about three minutes, including putting the caps at the end of the screws which hide and protect them against the elements. Since the SureFlap works on an existing RFID chip in the cat, it does mean the cat doesn’t need a collar or any kind of tag and it’s generally recommended that cats are chipped. The SureFlap costs around £76 – £90. 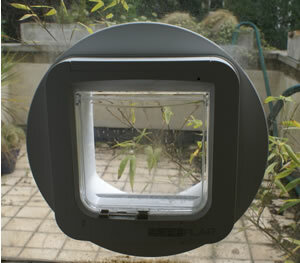 Could you tell me if the Sureflap will work with an Avid Pettracc with no starting from 9772, with a 13 didgit no. If not will we be able to purchase one in the near future. Would you have the names of suppliers in Canada, particularly in toronto? Have had one for a month now with success (as of April 2010). 1. My first concern was whether the (10-character, 24petwatch USA) RFID chip would be sensed at a great enough distance to be useful. I’d read several accounts from other firms and individuals discussing the limited “range” of these chips. CatMate (a competitor firm) said they wouldn’t even make a door that would respond to the common US chips. My concerns were unfounded. When first programming the chip in, my cat’s head was several inches from the sensor when it triggered. After a month, the response has been fine. 2. The second concern was whether the noise made by the device (kinda loud clack) would be off-putting to our animal. Within a day, she was using it, albeit with a hint of trepidation. I think if you follow the recommendations by SureFlap to get your pet used to the device, it should be fine, although we didn’t need to. 3. We’ve had manual multi-mode locking flaps broken several times by more bulletproof animals either shoving their way through or pulling the flap off its hinge. Not enough experience so far, in my opinion, but they haven’t succeeded at this point with the SureFlap. I should note that I installed this on a thick wall, so put the SureFlap on the inside wall surface, and left the original more-weather-tight flap on the exterior (which is just left to swing freely both ways). So our cat has to negotiate both flaps with about an 8″ gap between them. 4. The door has a 4-way (open both ways, locked both ways, open one direction) manual over-ride lock that can be set at night if desired. Previous Previous post: Zune HD: Finally Decent Looking But No HD Screen!